Read the first 28 pages HERE! 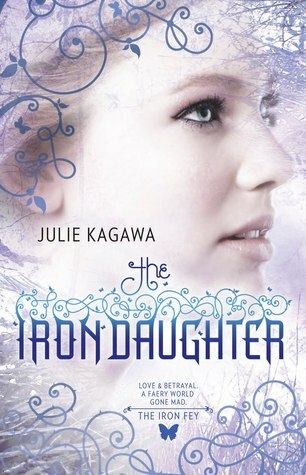 The Iron Daughter is the second book in Julie Kagawa's highly acclaimed Iron Fey series. It again follows Meghan Chase, this time as she tries to come to terms a bit with what she learned of herself in the last book. The story starts out in the Winter court where Meghan went at the end of the previous book, as per the deal she and Ash made in The Iron King. There she has stayed for an indiscernible amount of faery time (about 5 months human time, we later discover) by herself with no one (not even Ash, who was off pulling an Edward Cullen – Me: Must. Strangle. The. Stupid. Fey.) but a bunch of Winter fey who hated her purely based in the principle that she was half-human, and half-Summer fey. That was basically the whole first part of this book. Meghan sitting around in the Winter court not doing much more than pining, and me being irritated about none of these faeries, who are supposed to be so awesome at finding loopholes, being able to see the one that was so obviously glaring them in the face (Meghan, as far as I know, was the only one who did see it, but not until page 122 when it would do her no good because she had already left the Unseelie court! )– Oh! And then me being irritated that Ash was pulling an Edward Cullen (But, if you thought I didn't love you... – Me: Why you little–! *wraps hands around Ash's throat* – apparently, I'm big on Simpson's analogies when it comes to the Iron Fey...). Still, this book picked up a lot quicker than the first in the series. Especially after the Scepter of the Seasons is stolen, which is when the real adventure of this book begins. Overall, I think Kagawa did a lot better with this book. The characters (evil villains included) were much more well developed. Virus, for example, was simply terrifying with what she could do, her ambition and her (not in a good way) crazy. One of the other characters that I absolutely LOVED was Ironhorse. Even though he was an enemy in the first book, I found his constant NEED TO SHOUT EVERYTHING HE SAID LIKE THIS endearing. How can you not love a character, evil or otherwise, who talks like that? In this book, he elects to help Meghan complete her Scepter-finding mission, even going so far as to promise to protect her with his life (which is big with faeries). We find out later in the book why he chose to do so (though I had my suspicions, and maybe it was just my suspicions that thought it was his reasoning all along), and I'm not necessarily talking the “official” story. With the strength of his loyalty to Meghan, and the fact that he never wavered in his beliefs, it was hard not to love him even more by the story's end. Even if he was made of Iron. I also thought the relationships worked a bit better this time 'round, too, even if the whole Edward Cullen thing irritated me. Then again, I'm still wholly Team Ash (even if I adore Puck), so he must have done something right (like I said in my The Iron King review, I am a sucker for those who feel the need to deny their obvious love in any way, shape, or form – except Edward Cullen. I was totally all for Emmett in those books – not with Bella, just loved Emmett). I love that Kagawa actually tried to give Puck a fighting chance this book. He was gone so often in the first one that I felt sorry falling for Ash when I knew Puck was supposed to be the other guy and I barely got a chance to know him. Unfortunately Puck seems to have the book-best-friend curse going for him, where though he is loved (a lot), that love is not as intense as the love for the new guy. Sorry Puck, but I'm a sucker for the intense. As expected, the world of Nevernever was, again, masterfully crafted. Kagawa's imagery was simply beautiful. Even in the (duller) human world, It was enough to actually put me there. I would rate The Iron Daughter 4.7 Crazy Hearts. It's a lovely, fantastical, romantic read. Definitely worth spending some time on. Off to read The Iron Queen! Please Note: It has been brought to our attention that some people, when viewing this entry form, see one from a giveaway we did previously, and not one for the Iron Fey.. If you are one of those people, do not be discouraged, the form on this post here should show the correct giveaway. The Versatile Blogger: We Won!